Industrial Strength is on a mission to bring out the monster in your music. We have another Massive sound bank for bass line music producers looking for a diverse sound set for music or video game productions. 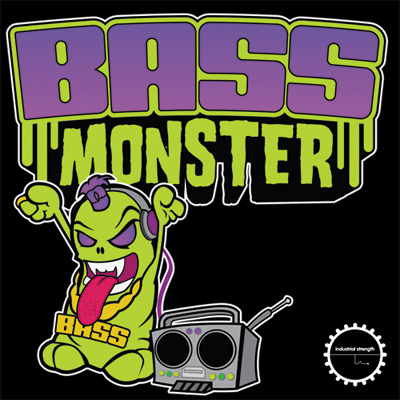 Bass Monster is a blistering Ni Massive sound set for Electro, Fidget, Dubstep, Grime, Electro House, Tech House, Nu Disco and of course Techno music. This fierce sound set was produced by Nicky Twist and Chris Cee from Monster Bass Music in New York. or riff. Each sound is labeled and contains all the attributes needed to find any sound with ease. This blinding collection is laced with cutting edge sounds which are great for bass lines, leads, sequences, filler sounds, effects and everything you need to get your riffs cooking with fire ! Nicky Twist and Chris Cee have multiple releases on various labels in the USA and internationally. They have found a love for designing original sounds while producing their tricked out style of music. This dope selection of patches reflects their modern underground music production style in a big way. On top of being a well known DJs in the New York rave scene, the boys have rocked tracks on labels such as Wonked Music, Peak Hour Music and Plasmapool. They are currently doing remix work for artists such as Hypster, Dark Punk, Adrien Aubern and Francois Dennig among others. Monster Bass is the perfect sound set to add a taste of New York underground to your Ni Massive soft synth. The drums in the demo are not included.